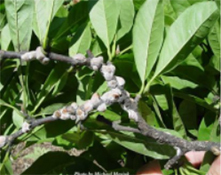 These soft brown Magnolia Scale insects can kill trees if abundant. 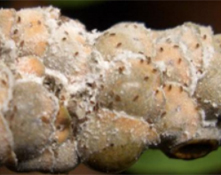 Feeding injury causes honeydew, sooty mould and twig dieback. The honeydew attracts bees, wasps and hornets. They overwinter as partly grown young, and begin feeding in spring and summer. Young scales are small, flat and inconspicuous. Adults may be brown or mottled orange, with shallow wrinkles. This fungus aids as a protective armor. By late August most of the females have produced nymphs that migrate to and settle on the new growth of a twig, where they start the cycle again. Depending on how badly infested a tree is, it could take several years to gain control. Apply dormant oil in the spring or fall. 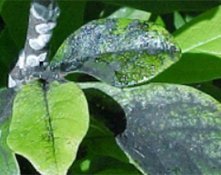 Apply Insecticidal soap, horticultural oil and approved insecticides during the crawler stage (late summer and early fall). More than one treatment is advised. On smaller trees the scales can be removed by hand scraping.